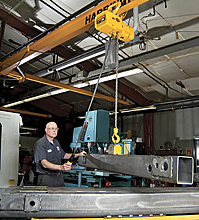 No matter the type or style of hoist, when you add it to a crane or similar equipment, you've just increased materials handling efficiency for heavy loads. Without the heavy lifting capability of hoists, cranes would be severely limited in functionality and great amounts of brute strength would still be needed to move large objects. Compact in size and lightweight, Mini Puller Hoists are for quick and easy lifting of 1/4 to 1/2 ton loads in tight spaces. Sturdy Weston style brakes provide holding power as the load is lifted and lowered using a lever handle to operate the lift/lower mechanism. A great compact hoist, the lever hoist is a manual chain hoist that works through a lever winch-type mechanism highly useful in construction, mining, manufacturing, shipbuilding, maintenance and repair work. Hand chain hoists deliver significant mechanical advantage through the use of a pull chain and reduction gears that reduce the amount of force needed to provide lift. Excellent for manufacturing and fabrication applications. An economical hoist and trolley combination, the low headroom trolley hoist is also very compact and durable. It provides not only lift capabilities, but also allows movement along a beam using either a push type or geared trolley that comes integral to the hoist. Electric hoists lift using a powered drive shaft to turn reduction gears and raise the load. It comes with special brake features, a count hour meter, and fan cooled motor. Controls are plugged into the hoist body and have control buttons for lift and lower. Adding a push trolley to the electric hoist gives you terrific control and flexibility in lifting and relocating a load. Through a pendant control, the hoist lifts and lowers the load. You manually 'walk' the load along a beam to its new location before lowering and releasing the load. Electric hoists with geared trolleys are made for precise placement along a travel path. Once a load has been lifted, the rotation of a hand chain drives the trolley to the selected location. Very useful for repetitive lift and travel actions in assembly and production applications. Electric trolley and hoist combinations provide the most efficient load handling capabilities. Powered lift and traverse along a beam. Increase handling speeds, especially for very heavy loads on long beam runs. Controls provide precision handling. Built for reliability, harsh work conditions and repetitive lift, lower and transfer actions, air powered chain hoists handle extremely heavy loads easily and have great endurance in foundries, manufacturing assembly lines, and construction work. Keep air hoses organized and ready for use with these hose storage cabinets that accept both pneumatic and hydraulic hose in varying sizes and length. Save time - stop having to detangle hoses.